I have 180 groups (see image for example), each group is a different label design. I need to export each group as an individual PDF file. What is the best way to achieve this? I know how to export them individually and how to bulk export to png, jpg etc. but I can't figure out how to export to PDF. 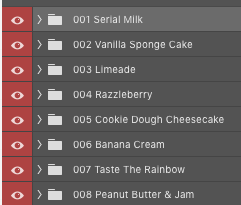 I've tried exporting layer comps but that exports as one big pdf and not individual files. Any help will be greatly appreciated, thanks in advance! EDIT - I'm not looking to batch export Photoshop layers to individual PNG files. Right click each group and 'Merge Group', do this individually for each group. Select all files and then Export Layers To Files and select PDF. This is the easiest way I've found so far. I was actually looking for a script or method to do the individual grouping automatically but haven't found a method yet. Not the answer you're looking for? Browse other questions tagged adobe-photoshop pdf export photoshop-scripting or ask your own question. Any way to export multiple layer comps to single psd in Photoshop? Script that export photoshop layer groups to PNG files?